Mitsar manufactures high quality and affordable EEG amplifiers to acquire, display and store the electrical activity of a patient's brain to aid in diagnosis (FDA 510K K143233). Mitsar is the perfect fit for hospitals, neurologists, research and clinical office settings. The Mitsar 201 and 202 models are designed for the recording and analysis of the encephalogram with 19 or 32 active channels. Additionally the Mitsar can be utilized for video monitoring and evoked (event related) potentials. Included software makes it a complete solution for QEEG analysis and guiding neurofeedback. Nova Tech EEG is the exclusive North America & South America distributor of Mitsar products. The Mistar EEG 201 system provides 21 channels of QEEG + 1 – 4 active/reference pair pair for ECG. Intended for video EEG monitoring including spectral analysis of the electroencephalogram (EEG), as well as evoked (event related) potential recordings. The Mitsar 202 is a 32 channel system intended for EEG monitoring, recording, and providing spectral analysis of the electroencephalogram (EEG)signals as well as recoding of evoked (event related) potentials. 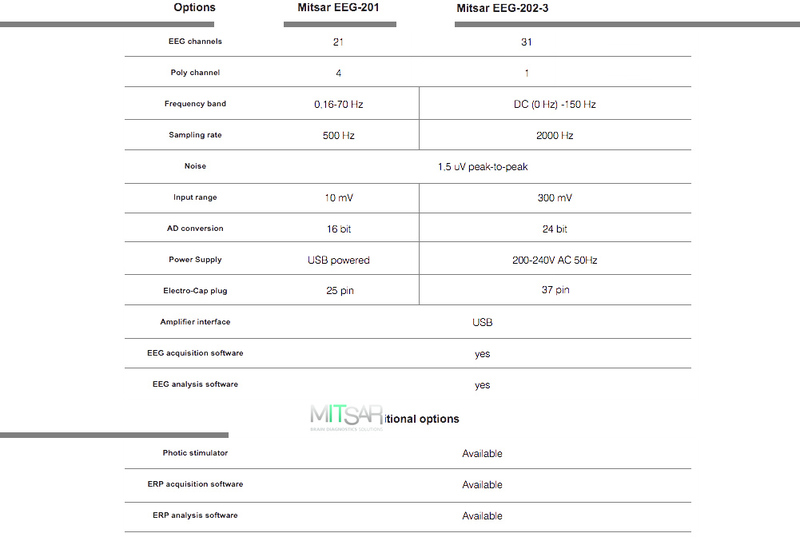 Make a comparison between the Mitsar EEG 201 and 202 amplifier systems and compare advanced technical specifications to help you make a purchase decision. Get Your Quote Online Now For Your Amplifier Purchase! The Mitsar-EEG amplifier systems offer a number of new features. High quality recordings with low USB powered amplifiers, safe computer interface with a screwed mini USB plug that protects your data, and electro cap systems that are compatible with ECI electrodes positioning systems. The Mitsar-EEG amplifiers are FDA 510K registered as a medical device for recording the electroencephalogram of the human brain to aid in diagnosis and monitoring. 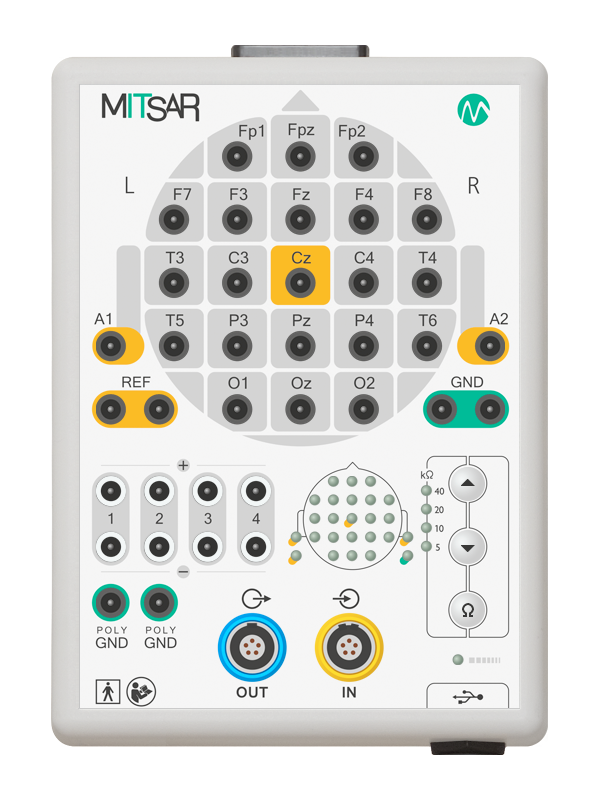 Mitsar-EEG 201 amplifier provides interface both for photo and acoustic stimulation. You can perform all standard EEG probes with our LED red/white colored Mitsar-Photic flash lamp and acoustic Mitsar-Phono stimulator. Mitsar-EEG models 201 there are 4, 202-24 there are 8, 202-31 there is 1 reference pair electrodes are available for addition signals recording. Following biological parameters can be recorded simultaneously to EEG data: ECG, EMG, EOG or Respiration. Mitsar-EEG 201 and 202-24 machines are fully compatible with standard 19 channel ECI caps that are positioned to the international 10/20 method of electrode placement. A1 and A2 channels are now included in the ECI plug pin out. Mitsar-EEG 202-31 is compatible to 31 EEG channel customized Electo-Cap designed according to modified 10-10 positioning system. A1 and A2 channels are now included in the ECI plug pin out. Call for more information. Basic EEG software package includes not only EEG acquisition, review with signal processing, and artifacting tools, but full range of QEEG Analysis including FFT,Coherence, Indices as well as Independent Component analysis (ICA). Event-Related Potentials (ERP) option is also available for all models. It includes a number of world recognized visual and auditory tests with ERP analysis features including ICA for ERP’s. 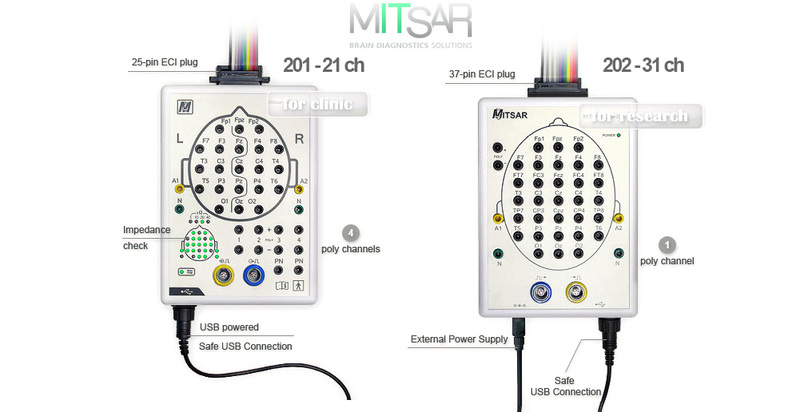 Mitsar-EEG 201 machine is based on USB interface. New secure connection to the amplifier with screwed USB plug protects losing your data by accident. We supply 5 meters mini USB cable that fits almost all EEG rooms. Our new Mitsar-EEG-201 amplifier modification is USB powered and does not need additional power supply. This is a portable EEG solution for your clinic and outdoor investigation with high-quality recordings in unscreened areas. Nova Tech EEG provides their Customer’s with free technical support for Mitsar Amplifiers, accessories and WinEEG & EEGStudio Software. We will also help our customers with the initial installation and software settings. Technical Support is available Monday – Friday from 9:00 am through 5:00 pm MST (Arizona) by calling (480) 219-3048 or sending an email to support@novatecheeg.com. The Mitsar EEG amplifiers come with a variety of accessories; Electro Cap systems, ERP kits, WinEEG and EEG Advanced Software, Human Brain Indices Database and add-ons, Neuroguide collection module, video capture card, camera, 10/20 Brainnet, LED Photic Lamp, NTE adult database, VideoQEEG option, SKIL v3.65 New user and SKIL v3.0 upgrade. When receiving a quote, additional accessories and add-ons can be discussed in detail. Electro-Caps are an EEG electrode application technique. They are made of an elastic spandex-type of fabric with recessed, pure tin electrodes attached to the fabric. The electrodes on the standard caps are positioned to the International 10-20 method of electrode placement. The medium Electro-Cap will fit approximately 65% of all patients over the age of 5. The small cap will fit primarily children from the ages of 2 to 5 years. The extra small cap will fit most children from 9 months to 2 years of age. Sizes in age are approximate; the patient should always be measured to determine proper cap size. 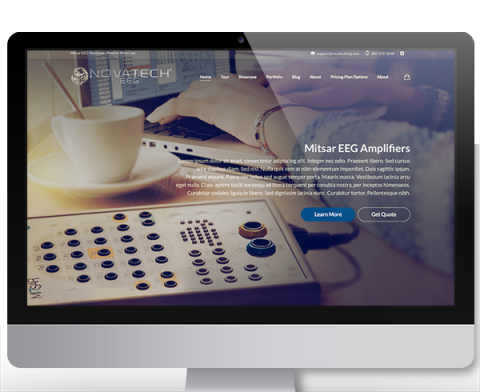 "Our facility requires FDA 510K registration as an EEG medical device and Mitsar delivers like no other amplifier in its category or price offering." 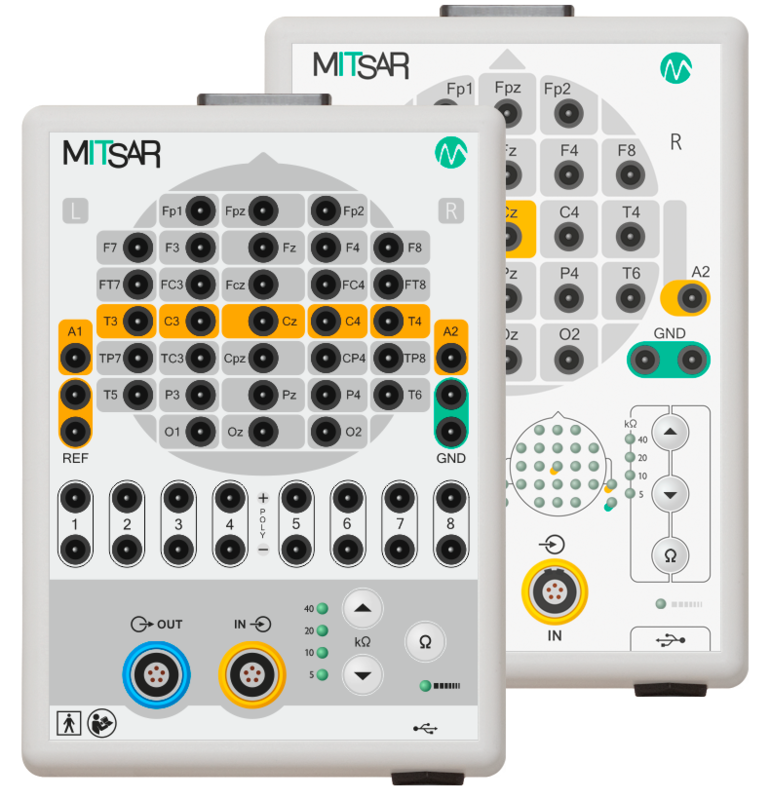 "I've used Mitsar as the EEG amplifier in my office for many years with complete satisfaction." "The ease of use and reliability of the Mitsar system makes it hands down my preferred EEG recording device." EEG amplifier, USB cable, Power supply unit (only with 202 units), Poly channel leads, EEG acquisition software, EEG analysis process, Device operation manual. Download software applications for recording and analysis and drivers for Mitsar operation. What Mitsar Product Do You Want Pricing Information For?